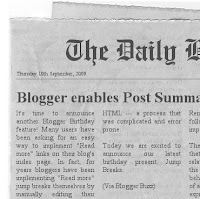 Blogger Buster: Read More/Post Summaries Now Available in Blogger!! The easiest way to test this new function is to use Blogger's new post editor, either by creating your blog posts through Blogger in Draft or by enabling this through the Settings>Basic tab of your dashboard. Once enabled, you should see a new button on the toolbar to insert a "Jump Break". Place your cursor where you would like the jump break to start in your blog post. If you prefer not to use the new post editor, you can simply insert <!--more--> in the place where you would like the jump break to appear. Those of us who have customized our Blogger templates will probably need to edit the Blog Posts section of the template in order to add the code required for this new Read More function. The Blogger Team have added some instructions for adding this function to our templates on this page. Note: this currently refers to Classic Templates, though the actual code presented is for use with Blogger Layouts (gadgetized) templates. In the meantime, check out the announcement post on Blogger Buzz or Blogger in Draft to learn more about Blogger's implementation of Read More.